is the answer to most questions. Strength Training is the key to your overall fitness! Sorry to you cardio princes and princesses out there, but if you want to transform your body to be a lean, mean metabolic machine... strength training is a MUST. Why is strength more important than hanging out on the elliptical? But, if you are looking to transform your body, these are not the most effective ways. Strength training is! Obviously, we want to burn calories when exercising, but ultimately, unless we are training for a race or competition, using and loosing body fat is the main goal for most people. Strength training will help you to increase your metabolic rate and therefore burn body fat both during and post workout much more than any other form of exercise. This is possible because strength training increases your lean muscle mass. (Think about this as increasing the firmness and density of the muscle, not necessarily the actual size of the muscle). As your lean muscle mass increases, so does your resting metabolic rate. When these increase, it means that you burn more calories at rest. You burn more calories when doing the same workout. You burn more calories when watching tv. You burn more calories when you're sleeping. So, how is this possible with strength training, but not running or any other form of exercise. Take running for instance, although it is great exercise and you burn lots of calories, it is all dependent on volume and isn't really designed at building muscle. Actually, running can be quite catabolic (muscle breakdown). Also, our body is a great adaptor. It's meant to be able to adapt to the imposed demands. So, where a mile once was a good workout, eventually is just enough to warm you up. You will always need to do more and more. Yes you can play with speed, tempo and frequency, but these are still directly correlated to volume. But, it's not very time efficient for body transformation. With strength training, you can change many more variables. You can add repetitions, weight, tempo, decrease resting periods, and even add exercises to make circuits. All of this is can be done without adding time to the workout. Also, another big variable is the variance of exercises. Changing the exercises will stimulate new pattern recognition for the nervous system and thus stimulate a metabolic boost too. Some workout modalities believe in the power of variance in exercises so much so that no workout is ever the same. At Rebirth, we serious disagree with this sentiment, and for good reason. The body will adapt to a program generally speaking between 4-6 weeks. We have all of our private clients and group classes follow a 4 week program to allow for proper progression. This allows for you to experience a workout, and measure your progress. which states that the nervous system will see the consistent imposed demands and respond. By following a structured strength training program, not only will you feel more comfortable with the movements and be able to progress, but your body will see the pattern and get stronger. So, if you've been following along, you know that we talk about eating a whole food based diet. We talk about exercise efficiency and progression. One of the other important pieces to complete the puzzle is mindset. This is a big one! At Rebirth Body Transformation Center, our clients get such great results because we are one of the few places that combine fitness, nutrition, and unlimited support in one complete program. We specialize in personal training in welcoming friendly environment that you'll actually want to spend time in. We are all about personal attention in a supportive, motivating, FUN small group setting. This is a recipe for a routine you can actually stick with, that keeps you invested and interested all while delivering meaningful, measurable results. Our 12 week body transformation program is literally like having a personal trainer, nutritional specialist and lifestyle coach all in one. It's the ideal initial measurement of time for you to build strong, healthier habits. Reach out to us if you think you need that extra accountability and guidance. Why are you waiting to take action? Because human nature is to procrastinate. We get it. We've been there too. 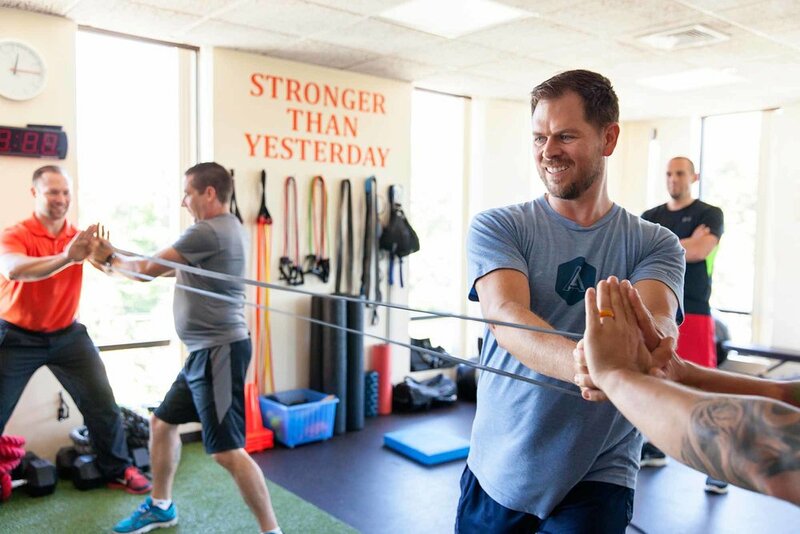 Our small crew of expert trainers are passionate about helping you get out of your rut, and into a healthy maintainable routine that is fun, simple and dynamic so you'll consistently blast through plateaus. Ready to make your strength training & workouts more efficient?